I’ve been through a very challenging time in my personal life recently after losing a close family member, which is why I haven’t been posting very much for a while. When life hits you for a ringer, it is easy to stop taking care of yourself. I ate a lot of comfort food even though I know better, and the Dragon helped out by doing a lot of the cooking for me and generally being a superstar husband by helping my family and I through a really difficult time. After allowing myself a week or so of leeway, though, I needed something yummy and healthy to help light the way back on track towards a healthy and bright future. It is time to start taking better care of myself again. 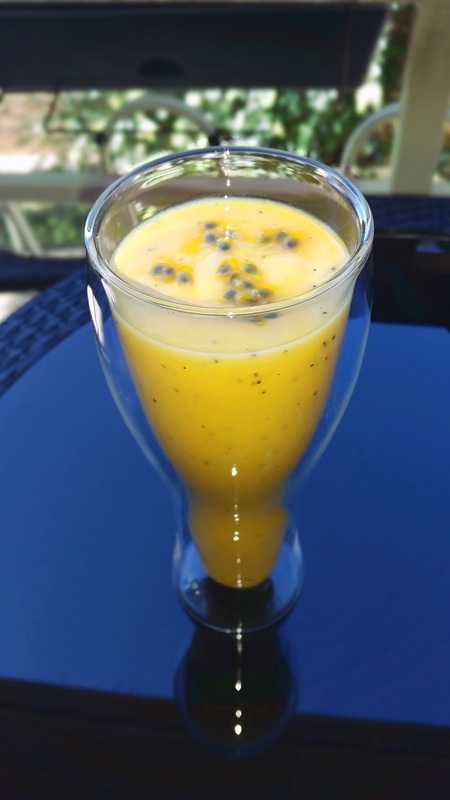 I wanted to make something which reminded me of a happier time, so what could be a better mood lifter than a delicious tropical smoothie to remind us of our honeymoon in Fiji? I have to say that it helped! This smoothie will lift you up when you need it and will also help you to celebrate the happiest of times. It would also work as a delicious party mocktail. Add a dash of champagne (post blending) and you have a tropical cocktail!